Hypertension, or high blood pressure, affects approximately 25% of the adult population in the United States and is determined by measuring both systolic and diastolic pressures. The exact causes of hypertension are not known but several factors and conditions may play a role in its development, including: smoking, being overweight, lack of physical activity, excessive salt intake, excessive alcohol consumption, stress, age, genetics/family history, chronic kidney disease and adrenal and thyroid disorders. Hypertension is frequently asymptomatic, but severe hypertension may cause the following symptoms: severe headache, fatigue or confusion, vision problems, chest pain, difficulty breathing, irregular heartbeat and blood in the urine. If left untreated, hypertension can damage the heart and blood vessels, and can eventually lead to several other conditions, including: stroke, heart failure, heart attack, kidney failure and vision problems. While drugs are available to treat hypertension, including ACE inhibitors, angiotensin receptor blockers (ARBs), diuretics, beta-blockers, and calcium channel blockers, these compounds all have limitations on their efficacy; therefore, there continues to exist a need for better medications to treat high blood pressure. Spontaneous hypertension is modeled using animals that have a genetic predisposition to developing hypertension. At Biomodels, we have used the Spontaneous Hypertensive Rat (SHR) model of hypertension, developed by mating Wistar Kyoto (WKY) rats with spontaneous hypertension and then maintaining and inbred strain with animals that share this phenotype. We can also employ other strains of mice and rats that exhibit a spontaneous hypertension phenotype, including C3H, ICR, Ob/Ob, Db/Db mice and SHR, SHHF, SHROB, ZSF-1, and ZDF rats. 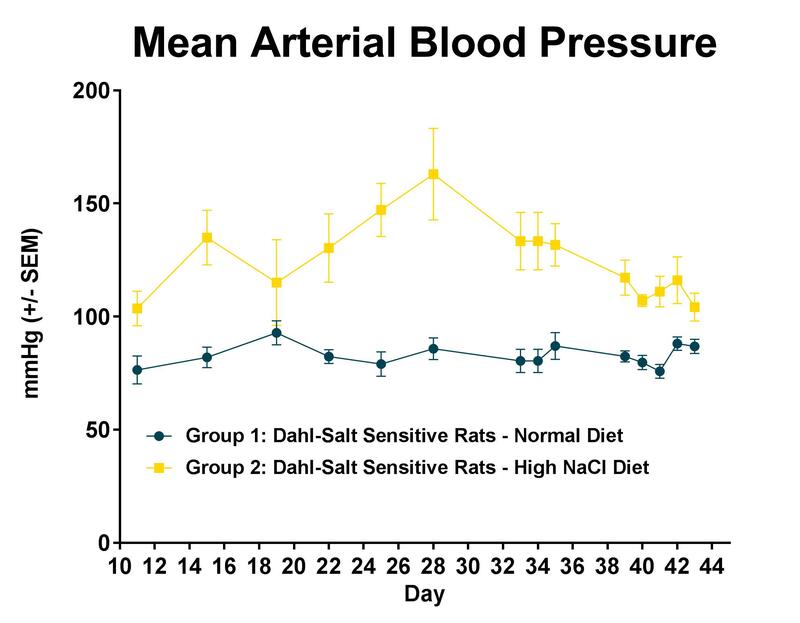 Diet-induced models of hypertension, such as the use of a high salt diet in Dahl-Salt Sensitive rats, are relevant to the equivalent condition in humans. Biomodels has the capability to perform experiments on mice and rats that examine the contribution of diet and obesity to hypertension, and explore the effect of experimental compounds in this relationship. For both models previously described, monitoring of blood pressure is performed using a tail cuff apparatus. The tail cuff apparatus is similar to the standard cuff used to measure blood pressure in humans. While the animals are temporarily restrained in a plastic rodent restrainer, the cuff is placed on the tail and inflated while the animals pulse is monitored on an oscilloscope. Values are obtained for systolic and diastolic pressure. Once a baseline reading has been obtained, animals can begin treatment with experimental compounds and blood pressure can be re-evaluated longitudinally once or twice weekly. Blood may be drawn weekly via tail vein draw to evaluate the levels of drug in the circulation. Studies may last for a period of between 4-8 weeks. A timeline of a typical blood pressure monitoring study is depicted below.